House of character in the historic center of Uzès, very quiet, protected area of ​​Uzés. In two words calm and intimacy. Look at the reviews it is the holidaymakers who talk about it the best, to summarize, most people who came in the house, feel like home after a few hours. Once your car is parked, you can flanned in the small streets of the historic center. The basics of the house are from the 11th century, it is an immersion in the oldest district of Uzès. Outstanding location in a gorgeous wee town. Phillipe was extremely helpful and gracious on arrival. Parking was facilitated, the house was well explained, and he also recommended some good restaurants as well as supplying some home made juice and wine. Five stars plus. Thanks for a great place to stay . Merci à Vous, au plaisir de vous revoir, peut être un jour à Uzes ou en nouvelle Zélande. Maison du Sonneur is a delightful house full of character and very comfortable. We had a very enjoyable three weeks in this property and would highly recommend it. A charming, well-equipped old house in a great location. We have visited Uzès many times over the past 20 years or so and it never loses its charm. This year we stayed a month at Philippe & Joelle’s house and enjoyed every day. Not wanting to drive a rented car in Europe any more, we relied totally on public transport; the local bus service, although not very frequent, is fantastic value for money, serving the local area and Nîmes, Arles, Avignon, Ales etc. The train services to/from Nîmes are good (and include, for example, direct trains from Charles de Gaulle airport). The gastronomic highlight was a long lunch at Victor Croizard’s restaurant in Nîmes – outstanding food and wine in a superb garden setting. The stalls at the Wednesday and Saturday markets in Uzès (5 minutes walk from the house) are good sources of delicious charcuterie and seasonal fruit & vegetables, including a wide range of organic produce. The house was well equipped – particularly in the kitchen – but also in terms of facilities, there being a second, small ensuite bathroom upstairs. One word of warning – for some reason, the local swimming pool does not allow men or boys wearing boxer shorts in the pool – only “Speedos” allowed! This is a wonderful summerhouse in the most beautiful part of Uzes. Philippe is a generous and patient host who helped us settle in and came whenever we needed assistance over our four month stay. On arrival the house was spotless and the garden well maintained. We stayed in this rustic summer home way into winter which was a challenge for us all to stay warm. Highly recommend the house for Spring, Summer or Autumn as it has the best internal garden courtyard in the old part of Uzes. A beautiful charming and welcoming village with everything you need to enjoy French country living at its best. You will not find a more generous or friendly host in Uzes. Thanks Philippe. "The house was absolutely charming. It is everything that you can possibly want in an old rustic house in the midst of a Medieval town. The house has all of today's modern amenities. It sets the tone and is in easy walking distance to fine restaurants, shops, ATMs, historic buildings and near a short hike whereby you can still see ancient Roman ruins of an aqueduct constructed about 2,000 years ago that fed into the Pont du Gard and onto Nimes. The neighborhood is quiet. Philippe and his wife Joelle were wonderful ambassadors to us. They took the time to show us the house, how the appliances work, then took us on a visit of the town. They are both most gracious and do take a serious interest in making your stay comfortable. They also provided us with a free parking pass on the outskirts of town (5 minute walk to the house) and some wine from their own vineyards! I cannot recommend this location and house highly enough." "What a delight! 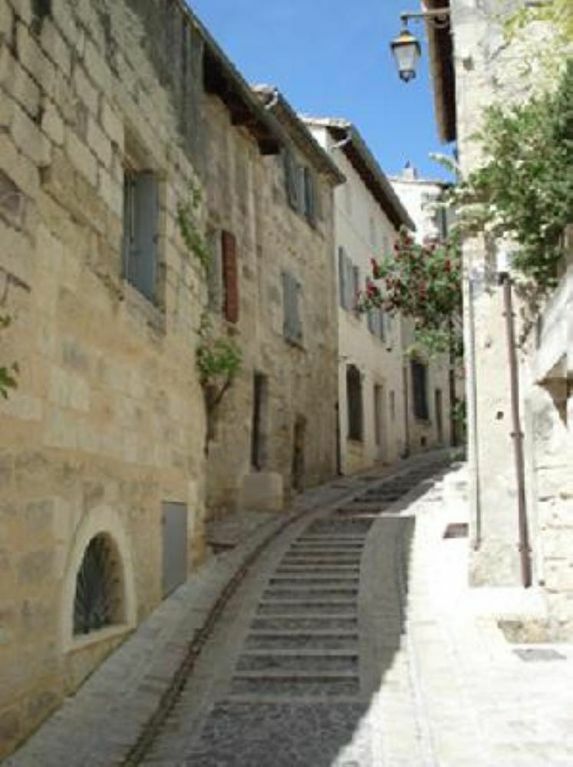 Superb location, close to all amenities in the central and historic part of Uzes. Gorgeous little private courtyard in which to have meals, complete with charcoal burner BBQ. House full of character and artwork. If you are after shiny and modern this ien't for you. Phillippe was a delight. Uzes is full of charm." parking on the parking Portalet, the street where the house is located on the parking lot. tarif dégressif en fonction de la durée, supplément chauffage selon la saison, caution demandée, acompte/arrhes à la réservation, remise des clés par le propriétaire non présent sur place. Promotion, 20% de réduction si réservation 1 semaine avant la date de votre arrivée.